COLUMBIA, Mo 03/14/15 (Beat Byte) -- BOOM! Ginny Chadwick is back -- and with a helluva bang! The former First Ward Columbia City Councilwoman -- who resigned in January amidst a high-octane effort to recall her -- has been shopping an allegation that Jake Loft committed a Federal offense during his campaign for the Council seat she vacated. Chadwick told a staff person in Boone County Clerk Wendy Noren's office that "she heard Loft was offering and/or giving money to people for registering to vote," Noren emailed Keep Columbia Free director Mark Flakne. 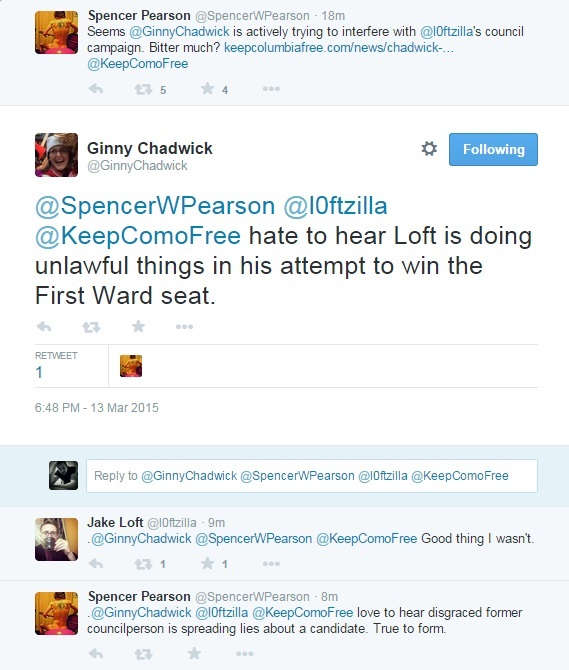 "Hate to hear Loft is doing unlawful things in his attempt to win the First Ward seat," Chadwick Tweeted (right; click for larger pic). Loft supporter Spencer Pearson accused her of "actively trying to interfere" with Loft's Council campaign. Noren found nothing, meanwhile, to substantiate the allegations. Part of the pro-Liberty movement that led the charge to recall Chadwick, Loft received the endorsement of pro-Grow advocate Eapen Thampy, who mobilized the marijuana legalization lobby against Chadwick after she broke a campaign promise to support small grow operations in the Columbia city limits. "I've been the target of a bitter former City Council member this week," Loft told supporters on Facebook. "This was nothing more than a feeble attempt to undermine the integrity of the people and stay in control." Flakne-- the pro-Liberty movement's CoMo leader -- filed a Sunshine Law request with Noren, who handles elections, about Chadwick's accusation. Noren replied that she asked the staff member who heard Chadwick's allegation if she "expected us to do something." Noren contacted Loft "by phone on the evening of March 9" and again "the morning of March 10." The County Clerk spoke with the deposed Councilwoman after her conversations with Loft. "I told Ms. Chadwick it was my belief that Mr. Loft was not making offers to pay people to register to vote," Noren emailed Flakne, who reported the controversy on the Keep Columbia Free website. "I let her know that I would forward the contact information of the U.S. Department of Justice (DOJ) if she needed to make a formal complaint." Noren also claims Chadwick seemed "more interested in information on what was possible in providing incentives for voter registration rather than filing a complaint. I said that she would need to get that information from the Justice Department." The DOJ's Election Crimes Branch handles violations of 42 U.S.C. 1973i(c) aka the False Information and Payments for Registering to Vote Act. "This statute prohibits 'vote buying' in the broadest terms possible by forbidding any 'payment' or 'offer of payment' made to a would-be voter 'for voting' or to induce unregistered individuals to get onto the electoral roles," Noren explained. "A 'payment' encompasses anything of material value." "I am satisfied, unless further evidence comes to me, that Jake Loft was not offering nor giving money to people to register to vote," Noren reiterated.